Daniel Gitau ran away from his arch rival Mekubo Mogusu at 14km to win in 1:01:08 while Nikki Chapple of Australia broke away from her competition even earlier, at 7km, writes Ken Nakamura. Windless and cool but bright conditions were close to ideal at the 10.35 start. In the men's race a trio of Gitau Mogusu and Tomoaki Bungo took off from the start, but Bungo dropped off at 3km to eventully finish 9th. Mogusu and Gitau passed 5km in 14:11 and 10km in 28:40 — 15 seconds up on the chase pack. At 13km, Mogusu made a move and stole 5m, but Gitau worked his way back and started to build his own lead, breaking away cleanly from Mogusu. Gitau passed 15km in 43:14, 30m up on Mogusu and ran the rest of the race alone. He led by 30 seconds at 20km and won by 35 seconds, improving his personal best (run the year before in Marugame) by 26 seconds. "Since I was able to set a personal best today, I want to aim higher," said Japanese-speaking Gitau after the race, adding "I really hoped to win this year. I wanted to make my move at the point I was left behind last year." He will join Fujitsu in April and continue to run in Japan. Immediately after the start of the women's race, Nikki Chapple, Mara Yamauchi and Hiromi Ominami formed the lead pack, passing 5km in 16:05. Chapple continued to push the pace, and by 7km, she was away, passing 10km in 32:25, ten seconds ahead of Ominami and Yamauchi, and 15km in 48:54) 36 seconds up. The Miyauchi twins then led the chase group which also included Megumi Seike, Yamauchi and Ominami. 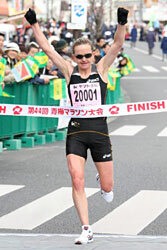 By 20km (which Chapple passed in 1:05:08) Yoko Miyauchi was 12 seconds ahead of her twin sister Hiroko. Chapple's winnning time was a 90 second improvement of her personal best of last year. At 28 years old, Chapple has recently made huge progress. Her coach, Nic Bideau says this is because she only started to train properly over the last year. Yoko Miyauchi's second place gave her a personal best. "I did not want to lose against my younger sister," said Yoko, who finished 10 seconds ahead of Hiroko. Yoko is planning her marathon debut in Nagoya in March. She hoped to run faster than her sister's debut time, 2:32:20. Making his move with 600m to run, Jonathan Kipkorir scored his latest, third, career victory in this 59th edition writes Ken Nakamura. He surged just before entering the stadium. "I picked up the speed to see what happen, and I did not see any response," recalled Kipkorir. Daniel Njenga had made a strong bid for victory at 40km but could not match Kipkorir's surge, finishing 30m behind. Jeffery Hunt of Australia, a marathon debutant, ran a very smart race. Running with the third group initially and keeping an even pace, Hunt ran strongly after 35km. His 5km splits varied only from 15:36-15:44 up to 30km, when he increased the pace to 15:03 and caught the leader at 39km. Although he could not stay with Kipkorir and Njenga when they kicked at 40km, Hunt finished a very respectable third. Keisuke Sawaki, managing director of the Japan AAF, said that Japanese runners could learn from Hunt's race. One other marathon debutant, Atsushi Ikawa, finished a with the 17th fastest marathon debut time by Japanese. The big Japanese marathon hope, Yu Mitsuya lost contact with the leader after 32km and finished ninth, almost five minutes slower than expected. "I want to run the marathon again" he confirmed after the race. Masashi Hayashi, in sixth and Kentaro Nakamoto in eighth improved their best times by one and two minutes respectively. After the pace makers dropped out at 30km eight runners were left: Kipkorir, Njenga, Hayashi, Ikawa, Mitsuya, Nakamoto, Kenneth Mungara, Chala Lemi. Hayashi and Ikawa then pushed the pace and by 34km Mitsuya was 10 seconds behind the lead pack of seven. Mungara took the lead at 36km and Hunt caught the group at 39km. Njenga's kick at 40km stretched the lead pack out, Kipkorir and Hunt staying close before Kipkorir caught Njenga just past 41km with Hunt in close pursuit. Kipkorir's winning move came just before he entered the Oita stadium. 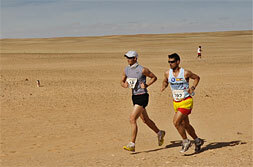 A windless and sun-bathed spring morning greeted the record field of over 2000 entrants for the 4th edition. In a stunning half marathon debut, Turkey's double Olympic silver medalist Elvan Abeylegesse tore through the last 6km, after a stuttering first 15km, to set a new course record. The first eight women were under 69 minutes. Men's favourite Deriba Merga inexplicably stepped off the road at 18km when the pack had reduced to four, opening the way for Geoffrey Mutai to extend the Kenyan win streak. The first four men broke the hour. "I felt easy at 15km (48:03) and it was only then I decided to start pushing the pace." said Abeylegesse. After working under Croatian coach Nicola Boric for just ten weeks, she admitted to being excited by what more she can do over this new distance. After passing 5km in 16:02, picking up through 10km in 31:54 but then dropping back to 48:03 at 15km, a group of six women remained at the front, including the winner, and five Ethiopians, Teyba Erkesso, Aselefech Mergia, Koren Yal, Mare Dibaba and defending RAK champion Dire Tune. Just as Tune had turned the screw in the late winds that spoiled last year's record attempts, firstly Erkesso then Abeylegesse, the only track specialist in the group, picked up the pace. Abeylegesse's 15:44 split to 20km saw Tune dropped back quickly, as Dibaba and Mergia hung on until the withering home straight surge came from the Abeylegesse. Her winning time is the quickest debut ever. The early pace in the men's race did the main protagonists no favours, leaving Mutai with a 59:43 clocking, which was not even a personal best. The pack chose to ignore the pacemaking and started cautiously, a pack of thirteen passing through 5km in 14:04, 14 seconds outside of schedule. Thirteen became seven at 10km (28:11) by which time all thoughts of a world record had gone. At this stage, an unusually restrained race from Deriba Merga meant no-one was prepared to push on and the subsequent splits times of 42:33 at 15km (a 14:22 5km, six in contention) and 56:52 at 20km (14:19, four left in it) made even the one hour mark look precarious. Mutai had won the Valencia Half in 59:30 last November, and here had the confidence to be the first to push, from 18km. He took charge, and burned up the last 1097m in 2:51 for a six second win from Tadese Tola in his long-overdue debut at the distance. 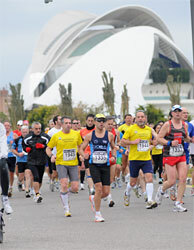 Last October's Eindhoven Marathon prepared the ground for barriers to be broken in Valencia. Winner Geoffrey Mutai went on to break the hour in the Valencia Half Marathon last November, and 29-year old David Njagi now pulverised the Marathon's course record. On a cool (8°C), windless morning punctuated with light showers of rain 3610 runners lined up at the Paseo de la Alameda, revisiting the earliest editions of the race. Conditions favoured fast running and Njagi took full advantage, setting a course record and missing the Spanish all-comers record (2:09:33, set in San Sebastian in 2002) by only 12 seconds. Behind him the next three finishers all broke the previous course record in this 30th edition of the race. They were helped by the efficiency of a trio of Moroccan pacemakers who drove the lead group through 10km in 30:59 and halfway on 2:10:30 pace. By 31km the entire group of invited elite athletes had been set up for a drive to the finish in which all seven of them managed to better their previous best times. Pre-race favourite Ben Kimwole improved by only 30 seconds, losing out to Njagi and Langat who both sliced two minutes off their personal best times. Behind them, there were even greater leaps forward, with Abraham Potongole and Tesfaye Sandiku in fourth and fifth places improving by four and five minutes respectively. At 10km the first Spaniard, last year's winner Andrés Micó, was already three minutes in arrears, and the gap grew ever wider. From 30km the race sped up, with a 5km split of 15:21 bringing the record within sight. But by 35km Njagi and Abraham Potongole headed the lead group after completing the fastest ever 5km split in the Valencia Marathon of 15:04. Then Njagi kicked, to quickly gain a winning advantage of 70m over compatriots Joseph Langat and Ben Kimutai Kimwole as Potongole lost distance. The last 3km were a lonely struggle against the clock for Njagi, now aiming to beat the 2:10 barrier. Gladys Chebet, in her debut Marathon, had no-one close to her for most of the race. She passed through halfway in 1:17:31 (2:35 pace) but had already started to slow slightly (from 2:32 at 14km). By 30km she was on 2:38 pace, with the veteran Moldovan Valentina Delion just less than five minutes behind. Although she would have been unaware of the closing gap Chebet's winning margin had been cut in half at the finish line. Over 3000 runners finished, more than ever before. Valencia's Mayoress, Rita Barberá, presented the trophies. There was a record entry of over 800 runners from 28 countries, for the 10th anniversary of this extraordinary event writes Pat Butcher. The race is run through the deserts of western Algeria, between three refugee camps, housing up to 200,000 Saharawi people, exiled from their Western Sahara home since 1975. Formerly Spanish Sahara, the territory was occupied by Morocco and Mauretania, when the Spanish withdrew on the death of General Franco. A freedom movement by the Frente Polisario drove out the Mauretanians, who eventually recognised the state of Western Sahara. But despite a UN resolution in favour of the Sahrawi, the Moroccans remain in control of much of the Western Sahara, while an attempt to mount a referendum on the future is in abeyance. Winner Jon Salvador from the Basque city of Bilbao set a new course record of 2:42:40. Three times previously he had run the half marathon, winning twice, and finishing third. "It was very hot at the start, and there were some good Algerians in there, and they went off really fast. But I knew the second half of the marathon course was more difficult, so I saved myself, and it paid off." "There are many Basques here," said Salvador, "around 85 of us. We really understand the suffering that the Saharawi people are going through. Yes, the competition is important, but it's also important to tell the problems that the people here are having. The two things go together." The fourth edition was run in dismal conditions with winners Masakazu Fujiwara and Alevtina Biktimirova giving up on the hope of fast times writes Ken Nakamura. Fujiwara in particlar, was happy to become the first Japanese male runner to win here. Biktimirova had harboured hopes of a personal best: "that's why I went out fast, but because of the weather I had to give up that goal." Cold rain and wind worsened as the race progressed, and the temperature, 7°C at the start, dropped. Arata Fujiwara, who was second in the men's race in 2008 finished second again, outkicking one of the pre-race favoutites Atsushi Sato. The first 5km, mostly downhill, was covered in a modest 15:11. From 15-30km the 5km splits barely dipped below 16 minutes. Passing halfway in 1:05:13, the race turned into a one of attrition. By 27km, the lead pack still had 24 runners. Not until Salim Kipsang made a move at 31.5km did it start to break up. Fujiwara brought the chasers back to the Kipsang's shoulder, but now they were down to eight. Fujiwara surged at 33km to open a gap on Kipsang and Sato. With the runners approaching Tokyo Bay, the wind began to pick up. Joseph Mwaniki did much of the leading before Fujiwara threw off his baseball cap and surged hard at 40km. Although he didn't look comfortable, Fujiwara continued to pull ahead of Sato and Arata Fujiwara. A nine-stong group of women passed 5km in 17:34 and 10km in 34:56. By 15km (52:04), Bikitimirova had broken away and continued to extend her lead through the 35km. She then slowed, but was so far ahead that her victory was sealed. After losing contact with Bikitimirova, Mizuho Nasukawa, Robe Guta and Julia Mumbi formed the chasing group. Akemi Ozaki passed all three at 25km to move into second position but was later reduced to a walk. Guta moved ahead of Olaru at 35km and finished 13 seconds ahead of her. Unheralded Maki Kono covered the 35-40km faster than anyone to take fourth. In the 4th edition, already the biggest annual athletic event in Cyprus, winners Moses Kibet and Natalia Sergeeva both set a new race records. In both races the top three all broke the old records. 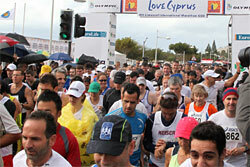 Participation records also tumbled, with a combined total of 1500 in the Marathon and Half, 10 km Health Run, Kids Run and Charity Walks — more than Cyprus could ever have expected. Beyond the Cypriots who honoured the race, there were also a lot of Greek runners who travelled to the big island — and runners from more than 20 countries: UK, Russia, Poland, Romania, Germany, Austria, Italy, Finland, Lebanon, Czech Republic, Hungary, Kenya, Ethiopia to name only some. The charity walks generated funds for causes such as: Make A Wish — for children with cancer; Volunteer Doctors — healing people in need after international conflicts or disasters; Europa Donna Cyprus — aid to prevent breast cancer; Alzheimers Support Association; Nicosia Children's Home. In the Half Marathon, Balkan Marathon Champion and record holder Iaroslav Mushinski took top spot. Former Marathon world record holder Paul Tergat presented the awards. Torrential rain fell before and during the race, but the weather improved and could not detract from the grand spectacle that this race is becoming as a flagship for Cypriot hospitality. 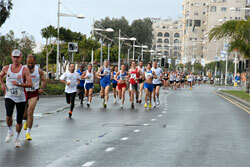 In the 8th edition almost 3500 runners took part. The town of Moshi came to life for the weekend, as hundreds of foreign athletes from all over the world flooded in to enjoy the event. Tanzanian Prime Minister Peter Pinda presided over the morning and presented prizes to the winners. Local 'sprinter' Fabian Joseph won the half marathon in a record breaking time. The Kenyans did well in the full Marathon, only being prevented from taking clean sweeps of the podium places in both events by third-placed woman Leah Kujar. Many social runners, from 26 countries as far apart as Australia, Mexico and Ireland enjoyed the day. Organisers would thank Hon Mizengo Peter Pinda, race sponsors, and the runners for making this event such a success.